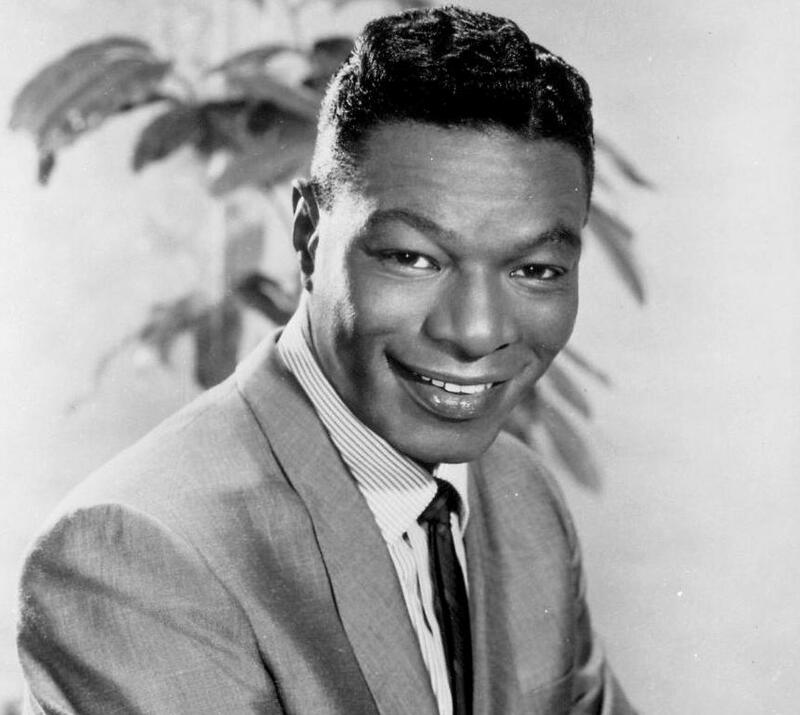 The great Nat King Cole whistles his way into the hearts of American television viewers on this episode of What’s My Line? 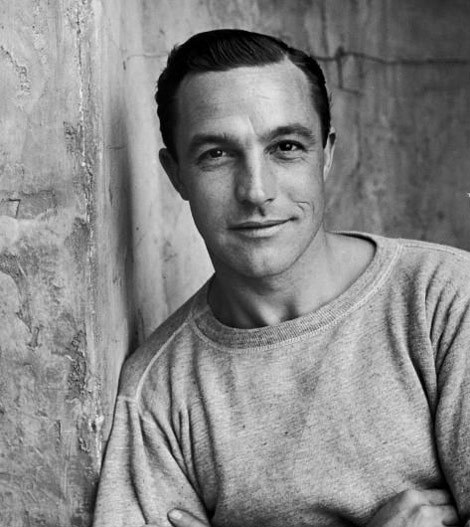 Eugene Curran “Gene” Kelly (August 23, 1912 – February 2, 1996) was an American dancer, actor, singer, film director, producer, and choreographer. Kelly was known for his energetic and athletic dancing style, his good looks and the likeable characters that he played on screen. Kelly was the recipient of an Academy Honorary Award in 1952 for his career achievements. He later received lifetime achievement awards in the Kennedy Center Honors (1982), and from the Screen Actors Guild and American Film Institute; in 1999, the American Film Institute also numbered him 15th in their Greatest Male Stars of All Time list. Kelly was born in the Highland Park neighborhood of Pittsburgh. He was the third son of Harriet Catherine (née Curran) and James Patrick Joseph Kelly, a phonograph salesman. His father was born in Peterborough, Ontario, Canada, to a family of Irish descent. His maternal grandfather was an immigrant from Derry, Ireland, and his maternal grandmother was of German ancestry. At the age of eight, Kelly was enrolled by his mother in dance classes, along with his elder brother James. They both rebelled, and, according to Kelly: “We didn’t like it much and were continually involved in fistfights with the neighborhood boys who called us sissies…I didn’t dance again until I was fifteen.” At one time Kelly’s childhood dream was to play shortstop for the hometown Pittsburgh Pirates. Kelly returned to dance on his own initiative and by then was an accomplished sportsman and well able to take care of himself. He attended St. Raphael Elementary School in the Morningside neighborhood of Pittsburgh. He graduated from Peabody High School in 1929 at the age of sixteen. He enrolled in Pennsylvania State College to study journalism but the economic crash obliged him to seek employment to help with the family’s finances. At this time, he worked up dance routines with his younger brother Fred in order to earn prize money in local talent contests, and they also performed in local nightclubs. In 1931, Kelly enrolled at the University of Pittsburgh to study economics where he joined the Phi Kappa Theta fraternity. While at Pitt, Kelly became involved in the university’s Cap and Gown Club, which staged original, comedic musical productions. Earning a Bachelor of Arts degree in Economics with his graduation from Pitt in 1933, he remained active with the Cap and Gown Club, serving as its director from 1934 to 1938, while at the same time enrolling in the University of Pittsburgh Law School. Also during this period, Kelly’s family started a dance studio on Munhall Road in the Squirrel Hill neighborhood of Pittsburgh. 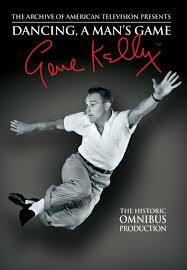 In 1932, the dance studio was renamed The Gene Kelly Studio of the Dance. A second location was opened in Johnstown, Pennsylvania in 1933. Kelly served as a teacher at the studio during both his undergraduate and law student years at Pitt. In 1931, he was approached by the Rodef Shalom synagogue in Pittsburgh to teach dance, and to stage the annual Kermess. This venture was successful enough that his services were retained for seven years until his departure for New York. Eventually, though, he decided to pursue his career as a dance teacher and full-time entertainer, so Kelly dropped out of law school after two months. He began to increasingly focus on performing and later claimed: “With time I became disenchanted with teaching because the ratio of girls to boys was more than ten to one, and once the girls reached sixteen the dropout rate was very high.” In 1937, having successfully managed and developed the family’s dance school business, he finally did move to New York City in search of work as a choreographer. After a fruitless search, Kelly returned to Pittsburgh, to his first position as a choreographer with the Charles Gaynor musical revue Hold Your Hats at the Pittsburgh Playhouse in April, 1938. Kelly appeared in six of the sketches, one of which, “La Cumparsita”, became the basis of an extended Spanish number in Anchors Aweigh eight years later. His first Broadway assignment, in November 1938, was as a dancer in Cole Porter’s Leave It to Me! as the American ambassador’s secretary who supports Mary Martin while she sings “My Heart Belongs to Daddy”. He had been hired by Robert Alton who had staged a show at the Pittsburgh Playhouse and been impressed by Kelly’s teaching skills. When Alton moved on to choreograph One for the Money he hired Kelly to act, sing and dance in a total of eight routines. In 1939, he was selected to be part of a musical revue “One for the Money” produced by the actress Katharine Cornell, who was known for finding and hiring talented young actors. Kelly’s first career breakthrough was in the Pulitzer Prize-winning The Time of Your Life, which opened on October 25, 1939, where for the first time on Broadway he danced to his own choreography. In the same year he received his first assignment as a Broadway choreographer, for Billy Rose’s Diamond Horseshoe. Betsy Blair was a member of the cast. He began dating Blair, and they married on October 16, 1941. Selznick sold half of Kelly’s contract to MGM for his first motion picture: For Me and My Gal (1942) starring box-office champion Judy Garland. Kelly claimed to be “appalled at the sight of myself blown up twenty times. I had an awful feeling that I was a tremendous flop”, (Betsy Blair told a different story!). For Me and My Gal performed very well and, in the face of much internal resistance, Arthur Freed of MGM picked up the other half of Kelly’s contract. After appearing in a cheap B-movie drama Pilot #5 he took the male lead in Cole Porter’s Du Barry Was a Lady opposite Lucille Ball (in a part originally intended for Ann Sothern). His first opportunity to dance to his own choreography came in his next picture Thousands Cheer, where he performed a mock-love dance with a mop. He achieved his breakthrough as a dancer on film when MGM loaned him out to Columbia to work with Rita Hayworth in Cover Girl (1944), where he created a memorable routine dancing to his own reflection. Despite this, noted critic Manny Farber was moved to praise Kelly’s “attitude,” “clarity,” and “feeling” as an actor while inauspiciously concluding, “The two things he does least well – singing and dancing – are what he is given most consistently to do.” In 1944 he also starred in Christmas Holiday. 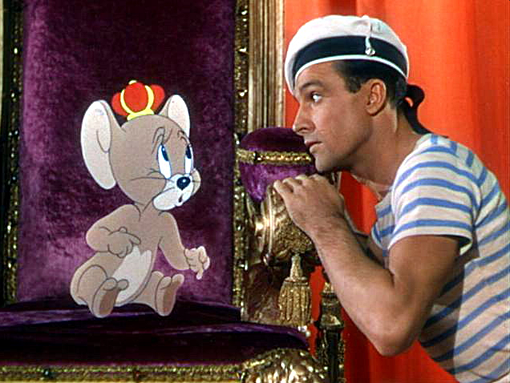 In Kelly’s next film Anchors Aweigh (1945), MGM virtually gave him a free hand to devise a range of dance routines, including the celebrated animated dance with Jerry Mouse, and his duets with co-star Frank Sinatra. The iconic performance was enough for Manny Farber to completely reverse his previous assessment of Kelly’s skills; reviewing the film, Farber enthused, “Kelly is the most exciting dancer to appear in Hollywood movies.” Anchors Aweigh became one of the most successful films of 1945 and it garnered Kelly his first and only Academy Award nomination for Best Actor. In Ziegfeld Follies (1946) – which was produced in 1944 but not released until 1946 – Kelly collaborated with Fred Astaire – for whom he had the greatest admiration – in the famous “The Babbitt and the Bromide” challenge dance routine. At the end of 1944, Kelly enlisted in the U.S. Naval Air Service and was commissioned as lieutenant junior grade. He was stationed in the Photographic Section, Washington D.C., where he was involved in writing and directing a range of documentaries, and this stimulated his interest in the production side of film-making. On his return to Hollywood in the spring of 1946, MGM had nothing planned and used him in a routine, black-and-white movie: Living in a Big Way. The film was considered so weak that Kelly was asked to design and insert a series of dance routines, and his ability to carry off such assignments was noticed. This led to his next picture with Judy Garland and director Vincente Minnelli, a musical film version of S.N. Behrman’s play The Pirate, with songs by Cole Porter, in which Kelly plays the eponymous swashbuckler. The Pirate gave full rein to Kelly’s athleticism and is probably best remembered for Kelly’s work with The Nicholas Brothers – the leading African-American dancers of their day – in a virtuoso dance routine. Now regarded as a classic, the film was ahead of its time, but was a box-office flop. Stanley Donen, brought to Hollywood by Kelly to be his assistant choreographer, received co-director credit for On the Town. According to Kelly: “…when you are involved in doing choreography for film you must have expert assistants. I needed one to watch my performance, and one to work with the cameraman on timing; without such people as Stanley, Carol Haney and Jeanne Coyne I could never have done these things. When we came to do On the Town, I knew it was time for Stanley to get screen credit because we weren’t boss-assistant anymore but co-creators.” Together, they opened up the musical form, taking the film musical out of the studio and into real locations, with Donen taking responsibility for the staging and Kelly handling the choreography. Kelly went much further than before in introducing modern ballet into his dance sequences, going so far in the “Day in New York” routine as to substitute four leading ballet specialists for Sinatra, Munshin, Garrett and Miller. It was now Kelly’s turn to ask the studio for a straight acting role and he took the lead role in the early Mafia melodrama: Black Hand (1950). This exposé of organized crime is set in New York’s “Little Italy” during late 19th century, and focuses on the Black Hand, a group which extorts money upon threat of death. In real-life incidents upon which this film is based, it was the Mafia, not the Black Hand, who functioned as the villain. Even in 1950, however, Hollywood had to tread gingerly whenever dealing with big-time crime, it being safer to go after a “dead” criminal organization than a “live” one. There followed Summer Stock (1950) – Judy Garland’s last musical film for MGM – in which Kelly performed the celebrated “You, You Wonderful You” solo routine with a newspaper and a squeaky floorboard. In his book “Easy the Hard Way”, Joe Pasternak, head of one of the other musical units within MGM, singled out Kelly for his patience and willingness to spend as much time as necessary to enable the ailing Garland to complete her part. 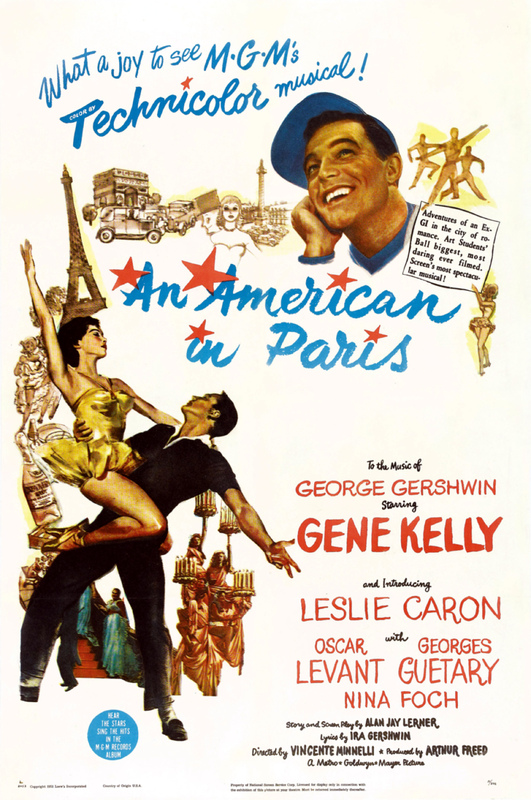 An American in Paris won six Academy Awards, including Best Picture and, in the same year, Kelly was presented with an honorary Academy Award for his contribution to film musicals and the art of choreography. The film also marked the debut of Leslie Caron, who Kelly had spotted in Paris and brought to Hollywood. Its dream ballet sequence, lasting an unprecedented seventeen minutes, was the most expensive production number ever filmed up to that point. It was described by Bosley Crowther as, “whoop-de-doo … one of the finest ever put on the screen.” Singin’ in the Rain featured Kelly’s celebrated and much imitated solo dance routine to the title song, along with the “Moses Supposes” routine with Donald O’Connor and the “Broadway Melody” finale with Cyd Charisse. Though the scene did not initially generate the same enthusiasm as An American in Paris, it subsequently overtook the earlier film to occupy its current pre-eminent place among critics and filmgoers alike. Kelly, at the very peak of his creative powers, now made what in retrospect is seen as a serious mistake. In December 1951 he signed a contract with MGM that sent him to Europe for nineteen months so that Kelly could use MGM funds frozen in Europe to make three pictures while personally benefiting from tax exemptions. Only one of these pictures was a musical, Invitation to the Dance, a pet project of Kelly’s to bring modern ballet to mainstream film audiences. It was beset with delays and technical problems, and flopped when finally released in 1956. When Kelly returned to Hollywood in 1953, the film musical was already beginning to feel the pressures from television, and MGM cut the budget for his next picture Brigadoon (1954), with Cyd Charisse, forcing the film to be made on studio back lots instead of on location in Scotland. This year also saw him appear as guest star with his brother Fred in the celebrated “I Love to Go Swimmin’ with Wimmen” routine in Deep in My Heart. MGM’s refusal to loan him out for Guys and Dolls and Pal Joey put further strains on his relationship with the studio. He negotiated an exit to his contract that involved making three further pictures for MGM. The first of these, It’s Always Fair Weather (1956) co-directed with Donen, was a musical satire on television and advertising, and includes his famous roller skate dance routine to “I Like Myself,” and a dance trio with Michael Kidd and Dan Dailey which allowed Kelly to experiment with the widescreen possibilities of Cinemascope. MGM had lost faith in Kelly’s box-office appeal and as a result It’s Always Fair Weather “premiered” at seventeen drive-in theatres around the Los Angeles metroplex. 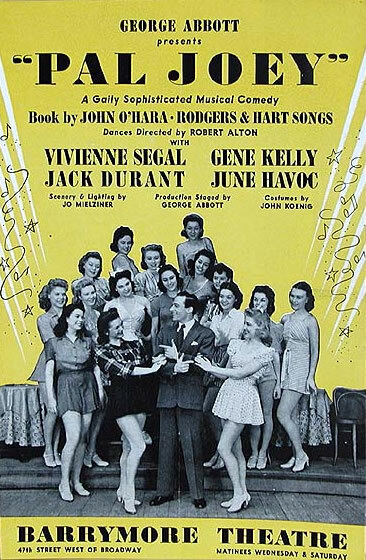 Next followed Kelly’s last musical film for MGM, Les Girls (1957), in which he partnered a trio of leading ladies, Mitzi Gaynor, Kay Kendall and Taina Elg. It too sold few movie tickets. The third picture he completed was a co-production between MGM and himself, a cheapie B-film The Happy Road, set in his beloved France, his first foray in a new role as producer-director-actor. Leaving MGM in 1957, Kelly returned to stage work. In 1958 he directed Rodgers and Hammerstein’s musical play Flower Drum Song. Early in 1960, Kelly, an ardent Francophile and fluent French speaker, was invited by A. M. Julien, the general administrator of the Paris Opéra and Opéra-Comique, to select his own material and create a modern ballet for the company, the first time an American had received such an assignment. The result was Pas de Dieux, based on Greek mythology, combined with the music of George Gershwin’s Concerto in F. It was a major success, and led to his being honored with the Chevalier of the Legion d’Honneur by the French Government. Kelly continued to make some film appearances, such as Hornbeck in the 1960 Hollywood production of Inherit the Wind. However, most of his efforts were now concentrated on film production and directing. In 1962, he directed Jackie Gleason in Gigot in Paris, but the film was drastically re-cut by Seven Arts Productions and flopped. Another French effort, Jacques Demy’s homage to the MGM musical: Les Demoiselles de Rochefort (1967) in which Kelly appeared, was popular in France and nominated for Academy Awards for Best Music and Score of a Musical Picture (Original or Adaptation) but performed poorly, elsewhere. He appeared as himself in George Cukor’s Let’s Make Love (1960). His first foray into television was a documentary for NBC’s Omnibus, Dancing is a Man’s Game (1958) where he assembled a group of America’s greatest sportsmen – including Mickey Mantle, Sugar Ray Robinson and Bob Cousy – and re-interpreted their moves choreographically, as part of his lifelong quest to remove the effeminate stereotype of the art of dance, while articulating the philosophy behind his dance style. It gained an Emmy nomination for choreography and now stands as the key document explaining Kelly’s approach to modern dance. Kelly also frequently appeared on television shows during the 1960s, but his one effort at television series, as Father Chuck O’Malley in Going My Way (1962–63), based on the Best Picture of 1944 starring Bing Crosby, was dropped after thirty episodes, although it enjoyed great popularity in Roman Catholic countries outside of the United States. He also appeared in three major TV specials: New York, New York (1966), The Julie Andrews’ Show (1965), and Jack and the Beanstalk (1967) a show he produced and directed which returned to a combination of cartoon animation with live dance, winning him an Emmy Award for Outstanding Children’s Program. In 1963 Kelly joined Universal Pictures for a two-year stint. He joined 20th Century Fox in 1965, but had little to do – partly due to his decision to decline assignments away from Los Angeles for family reasons. His perseverance finally paid off, with the major box-office hit A Guide for the Married Man (1967) where he directed Walter Matthau. Then, a major opportunity arose when Fox – buoyed by the returns from The Sound of Music (1965) – commissioned Kelly to direct Hello, Dolly! (1969), again directing Matthau along with Barbra Streisand. Those splashy “in your face” production numbers caused the film to flop. In 1970, he made another TV special: Gene Kelly and 50 Girls and was invited to bring the show to Las Vegas, Nevada, which he duly did for an eight-week stint – on condition he be paid more than any artist had hitherto been paid there. He directed veteran actors James Stewart and Henry Fonda in the comedy western The Cheyenne Social Club (1970) which performed poorly at the box-office. In 1973, he would work again with Frank Sinatra as part of Sinatra’s Emmy nominated TV special Ol’ Blue Eyes Is Back. Then, in 1974, he appeared as one of many special narrators in the surprise hit of the year That’s Entertainment! and subsequently directed and co-starred with his friend Fred Astaire in the sequel That’s Entertainment, Part II (1976). It was a measure of his powers of persuasion that he managed to coax the 77-year-old Astaire – who had insisted that his contract rule out any dancing, having long since retired – into performing a series of song and dance duets, evoking a powerful nostalgia for the glory days of the American musical film. Kelly continued to make frequent TV appearances and, in 1980, appeared in an acting and dancing role with Olivia Newton-John in Xanadu (1980), an expensive theatrical flop which has since attained a cult following. In Kelly’s opinion, “The concept was marvelous but it just didn’t come off.” In the same year, he was invited by Francis Ford Coppola to recruit a production staff for American Zoetrope’s One from the Heart (1982). Although Coppola’s ambition was for him to establish a production unit to rival the Freed Unit at MGM, the film’s failure put an end to this idea. In 1985, Kelly served as executive producer and co-host of That’s Dancing! – a celebration of the history of dance in the American musical. Kelly’s final on-screen appearance was to introduce That’s Entertainment! III. 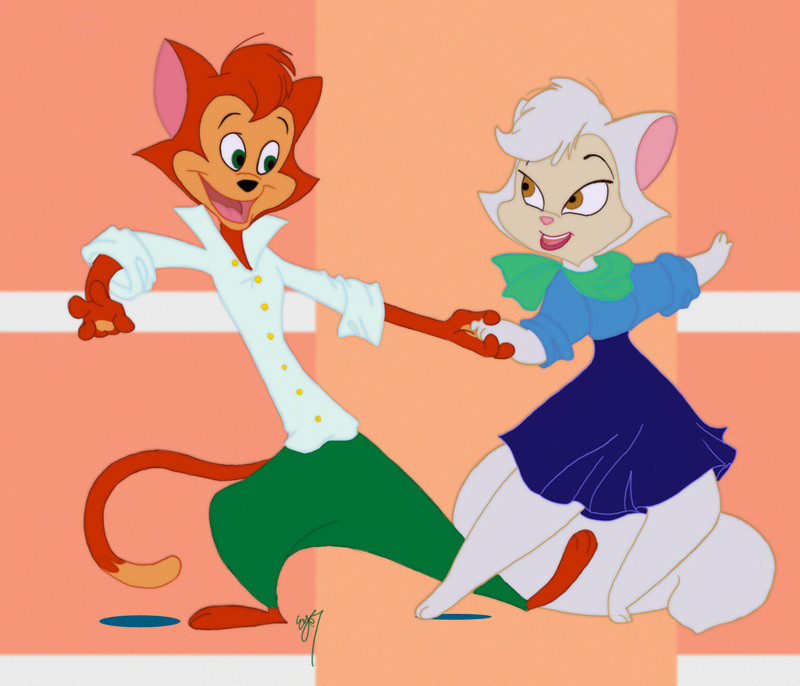 His final film project was in 1994 for the animated movie Cats Don’t Dance, released in 1997 and dedicated to him, on which Kelly acted as an un-credited choreographic consultant. When he began his collaborative film work, Robert Alton and John Murray Anderson influenced him; he strived to create moods and character insight with his dances. He choreographed his own movement, along with that of the ensemble, with the assistance of Jeanne Coyne, Stanley Donen, Carol Haney, and Alex Romero. He experimented with lighting, camera techniques and special effects in order to achieve true integration of dance with film, and was one of the first to use split screens, double images, live action with animation and is credited as the person who made the ballet form commercially acceptable to film audiences. There was a clear progression in his development, from an early concentration on tap and musical comedy style to greater complexity using ballet and modern dance forms. Kelly himself refused to categorize his style: “I don’t have a name for my style of dancing…It’s certainly hybrid…I’ve borrowed from the modern dance, from the classical, and certainly from the American folk dance – tap-dancing, jitterbugging…But I have tried to develop a style which is indigenous to the environment in which I was reared.” He especially acknowledged the influence of George M. Cohan: “I have a lot of Cohan in me. It’s an Irish quality, a jaw-jutting, up-on-the-toes cockiness – which is a good quality for a male dancer to have.” He was also heavily influenced by an African-American dancer Dancing Dotson, whom he saw at Loew’s Penn Theatre around 1929, and was briefly taught by Frank Harrington, an African-American tap specialist from New York. However, his main interest was in ballet, which he studied under Kotchetovsky in the early Thirties. As biographer Clive Hirschhorn explains: “As a child he used to run for miles through parks and streets and woods – anywhere, just as long as he could feel the wind against his body and through his hair. Ballet gave him the same feeling of exhilaration, and in 1933 he was convinced it was the most satisfying form of self-expression.” He also studied Spanish dancing under Angel Cansino, Rita Hayworth’s uncle. Generally speaking, he tended to use tap and other popular dance idioms to express joy and exuberance – as in the title song from Singin’ in the Rain or “I Got Rhythm” from An American in Paris, whereas pensive or romantic feelings were more often expressed via ballet or modern dance, as in “Heather on the Hill” from Brigadoon or “Our Love Is Here to Stay” from An American in Paris. According to Delamater, Kelly’s work “seems to represent the fulfillment of dance-film integration in the 1940s and 1950s”. While Fred Astaire had revolutionized the filming of dance in the 1930s by insisting on full-figure photography of dancers while allowing only a modest degree of camera movement, Kelly freed up the camera, making greater use of space, camera movement, camera angles and editing, creating a partnership between dance movement and camera movement without sacrificing full-figure framing. Kelly’s reasoning behind this was that he felt the kinetic force of live dance often evaporated when brought to film, and he sought to partially overcome this by involving the camera in movement and giving the dancer a greater number of directions in which to move. Examples of this abound in Kelly’s work and are well illustrated in the “Prehistoric Man” sequence from On the Town and “The Hat My Father Wore on St. Patrick’s Day” from Take Me Out to the Ball Game. In 1951, he summed up his vision as follows: “If the camera is to make a contribution at all to dance, this must be the focal point of its contribution; the fluid background, giving each spectator an undistorted and altogether similar view of dancer and background. To accomplish this, the camera is made fluid, moving with the dancer, so that the lens becomes the eye of the spectator, your eye”. Kelly’s athleticism gave his moves a distinctive broad, muscular quality, and this was a very deliberate choice on his part, as he explained: “There’s a strong link between sports and dancing, and my own dancing springs from my early days as an athlete…I think dancing is a man’s game and if he does it well he does it better than a woman.” He railed against what he saw as the widespread effeminacy in male dancing which, in his opinion, “tragically” stigmatized the genre, alienating boys from entering the field: “Dancing does attract effeminate young men. I don’t object to that as long as they don’t dance effeminately. I just say that if a man dances effeminately he dances badly — just as if a woman comes out on stage and starts to sing bass. Unfortunately people confuse gracefulness with softness. John Wayne is a graceful man and so are some of the great ball players…but, of course, they don’t run the risk of being called sissies.” In his view, “one of our problems is that so much dancing is taught by women. You can spot many male dancers who have this tuition by their arm movements — they are soft, limp and feminine.” He acknowledged that, in spite of his efforts — in TV programs such as Dancing: A Man’s Game (1958) for example — the situation changed little over the years. Kelly was a lifelong supporter of the Democratic Party that occasionally created difficulty for him as his period of greatest prominence coincided with the McCarthy era in the U.S. In 1947, he was part of the Committee for the First Amendment, the Hollywood delegation that flew to Washington to protest at the first official hearings by the House Committee on Un-American Activities. His first wife, Betsy Blair, was suspected of being a Communist sympathizer and when United Artists, who had offered Blair a part in Marty (1955), were considering withdrawing her under pressure from the American Legion, Kelly successfully threatened MGM’s influence on United Artists with a pullout from It’s Always Fair Weather unless his wife was restored to the part. He used his position on the board of directors of the Writers Guild of America, West on a number of occasions to mediate disputes between unions and the Hollywood studios, and although some on the right of championing the unions frequently accused him; the studios valued him as an effective mediator.